An immersive and explosive piece of musical theatre is set to kick off this month’s Arts Ensemble at Rich Mix. Fresh from a successful run at Soho Theatre, the immersive piece sees the eponymous Lady Vendredi rise through the ranks of extreme feminist cult M.A.M.A. (Mothers Against Male Aggression) who believe a female paradise can only be established by starting a gender war. Lady Vendredi is the alter-ego of Nwando Ebizie, a Hackney-based composer, recording artist, DJ and performer who runs the experimental theatre company Mas Productions with director Jonathan Grieve. “From an audience perspective the experience is going into a mythological space akin to a Greek Hades or a post-apocalyptic feminist cult,” Ebizie says. The idea for the character of Lady Vendredi is a hybrid of evangelical preacher and northern male comedian, Ebizie explains. “I’m really into black preachers and how when you watch their ceremonies they’re like pop stars. 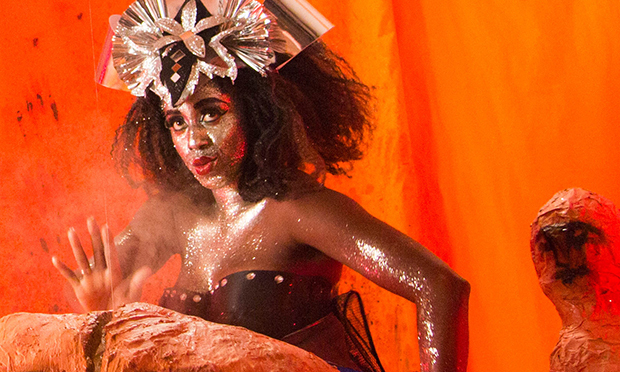 “But Lady Vendredi has her own alter egos that she transforms into during the show. One of them is influenced by white working class comedians. Ebzie was brought up in Oldham, and the idea of playing a character who is a charismatic master of ceremonies one moment, white male northern comedian the next, was born through the weight of expectation she felt getting up on stage as a black woman. “There’s a narrative that people expect when you’re a black woman performer, so I thought I’d give the audience something they wouldn’t expect,” she says. Allusions to myths and fairytales abound, and the show even references voodoo – something Ebizie developed an interest in whilst researching her ancestry in Nigeria. “I’m Igbo, which is a people from Nigeria, and I wanted to find out more about our rituals and dances pre-colonialism,” she explains. “It was quite difficult until we happened to meet a Haitian voodoo dance teacher. “It came about that the mythology, the ritual and rhythms and even the symbolic art, came from an Igbo indigenous script. One review of the show from its run at Soho Theatre earlier this year suggested audience members have a drink or two beforehand. How involved is it for audience members? “You don’t have to do anything like that,” she assures. “Basically it’s just like going to a gig where weird stuff happens.